How often do you search the internet? How long do you stay in front of your computer to read/browse Facebook updates? If, like me, you spend a lot of time on the internet reading updates, news or even playing games, then you might be interested to know that you can do that AND EARN MONEY as well. 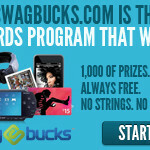 Let me introduce you to SWAGBUCKS. You can use your points to redeem various prizes that you can choose from the Swag Store. Available prizes include gift cards, electronic, household items, jewelry, school supplies, etc. I get excited everytime I reach 450 points because that means it’s time to get another $5 Amazon gift card for me! I have actually already redeemed three $5 Amazon gift cards and there’s still one on the way (it takes about 10 days to process the request). So if you’re interested in this, click the image below and start earning points while doing the things that you already do!